The Great Mitered Collaboration (2006-2008) between my sister and I is seamed,bordered, completed, packaged and mailed to our parents. Hop over to my blog for more views, the details, & links to entries on the whole looooong story. Bravo! You have done a wonderful job. I know how long it takes to make one of these. It's beautiful. Love your choice of colors! Wow, it is gorgeous. Congratulations. I thought nobody was every going to post anything on here again, and now this gorgeous blanket, which was worth waiting for. get money online with you simple website! How to use it, can me any help? This is wonderful! 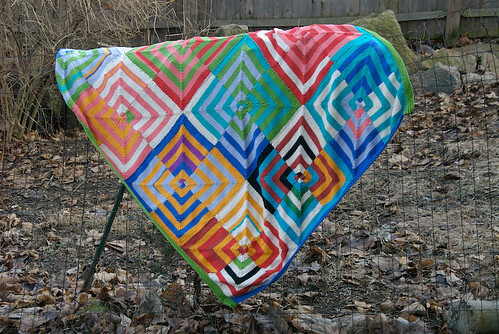 I am working on a mitered blankie, and hope it's as nice as yours turned out. World's Smallest Curve of Pursuit?